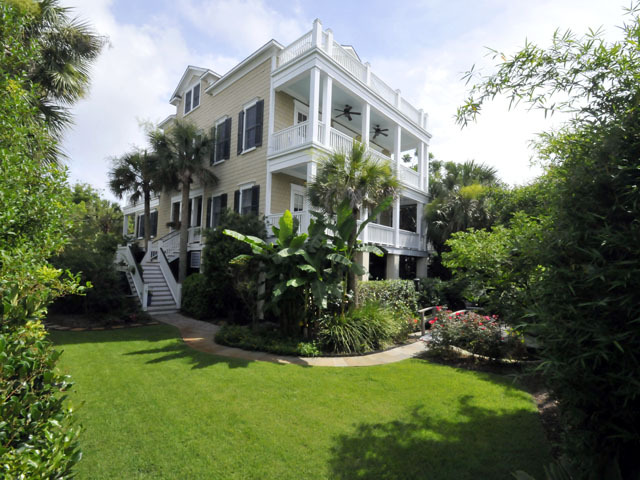 This stunning home at 104 Palm Boulevard is located on Isle of Palms and offers gorgeous views of Hamlin Creek and the Intracoastal waterway. The views can be well appreciated in this home from one of the many decks and porches—over 1,900 square feet of outdoor porch space in total! The interior of the home is just as beautiful as the exterior. There is an inverted floor plan to make the most of the views with the main living spaces on the second floor and the master suite on the topmost level. Inside, three of the home’s four bedrooms are found on the first floor along with access to the first floor deck. The master suite is located on topmost level and encompasses the entire floor including a sunny bedroom, a separate office, built in storage and a master bathroom. The spa-like master bath features double sinks, a separate bathtub and shower plus plenty of storage space. Private access to a third floor front and back deck can be accessed from both the water-facing master bedroom and backyard-facing office. The ground floor is not to be missed and offers lots of storage space as well an additional room that was designed as a man cave with 550 square feet of space, a partial kitchen and HVAC unit. The home also includes an elevator with access to all four floors making the entire home wheelchair accessible. When living at 104 Palm Boulevard, you will find yourself spending most of your time on the second story which was built for entertaining with a large and open floor plan that is flooded with natural light from the front and back porches. A gourmet kitchen serves as a focal point and is equipped with top of the line appliances. The adjacent family room and dining area are large enough to entertain friends and family plus they have wonderful views of the waterway and tons of natural light. Kick open the multiple sets of French doors and let the water breezes filter in! The backyard is also a true highlight with a beautiful patio and a gazebo with an enclosed a hot tub. The backyard is fully fenced in and landscaped with lush, tropical vegetation. Another unique selling point of 104 Palm Boulevard is its access to a private deepwater dock that is shared with the next door neighbor. The dock is outfitted with electricity and a sink, a covered area, a floating dock and an attached jet dock making it a perfect home for those who love boating. 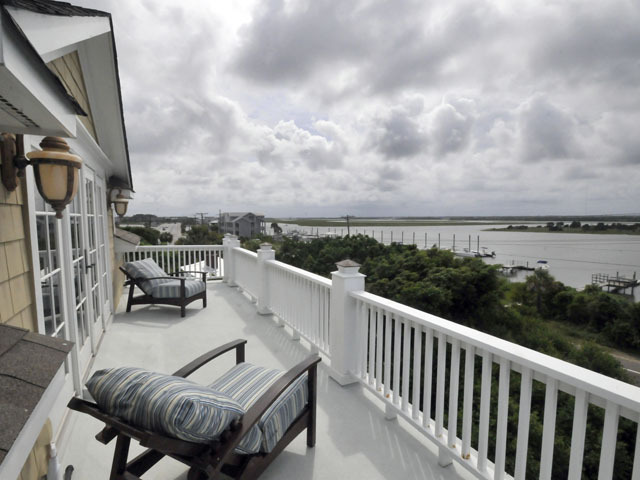 Having a deep water dock located so close to beach access is a rare find, and the gorgeous Isle of Palms beaches are fun for the whole family.